A groomsman is an important part of any wedding. Typically a groom selects several groomsmen to help with wedding details. On most occasions the groomsmen are chosen for their relationship to the groom (brother, cousin, uncle) or because they are good friends. Some common groomsmen responsibilities are to help the groom plan and execute the wedding, help the groom with wedding details, help the best man plan the bachelor party and to be a general “listening ear” and moral pillar of support for the groom. Considering today’s responsibilities for the groomsmen it is important to present them with a gift for their participation and effort. A traditional, yet modern gift is a custom engraved and personalized hip flask. This gift not only provides the groomsmen with a keepsake of the wedding but also provides a memorable and functional gift that can be used during the ceremonies. 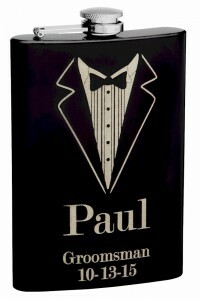 Custom engraved groomsmen hip flasks for weddings.